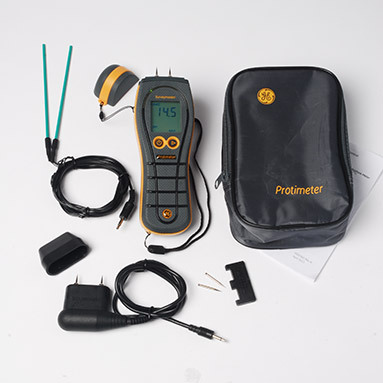 Protimeter Surveymaster dual-function moisture meter. Identify the extent of the moisture penetration. Diagnose the cause of the problem. Protimeter moisture meters and hygrometers satisfy these requirements comprehensively. 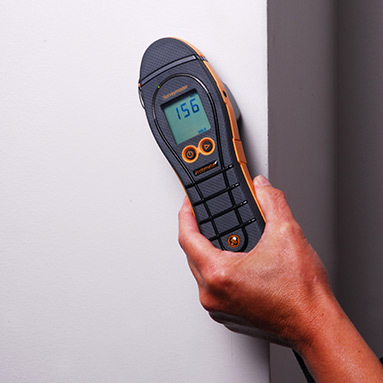 The Protimeter Surveymaster is the preferred industry choice for surveying and investigating moisture in buildings. 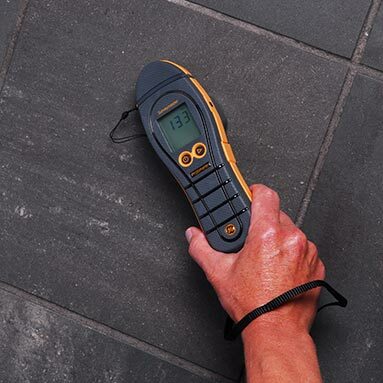 This reliable moisture meter has two modes of operation - search and measure. These functions can help the user to distinguish sub-surface from surface moisture - essential information when trying to establish the extent and cause of a dampness problem. Non-invasive pinless radio frequency finds moisture at depth where moisture is not always directly visible - up to 3/4 in (25.4 mm) below the surface. This mode is used to measure the moisture level at the surface and at incremental depth, when used with the auxiliary deep wall probes. Measure mode readings are precise and specific to the immediate area of contact of the electrodes. The actual moisture content of wood is shown on the digital display with the corresponding moisture condition shown on the accompanying scale of colour-coded lights. Wood Moisture Equivalent (WME) values are shown for other non-conductive, porous building materials. Pin-type probes measure moisture in wood and other building materials (use provided wood species calibration chart for more precise readings). Deep wall probes establish the presence of moisture in wall cavity insulation, sub and surface structures. Exterior Insulation and Finished Systems (EIFS) probe finds moisture in exterior insulation finishing systems. Hammer electrode for wood floor applications. Applications: Wood and wood floors, drywall, concrete and concrete block, stucco, plaster, masonry and EIFS. In both Pin and Search mode, GE’s patent pending Reference Mode can be used. Reference mode can be useful when trying to establish what materials are above or below a point of reference or dry standard. 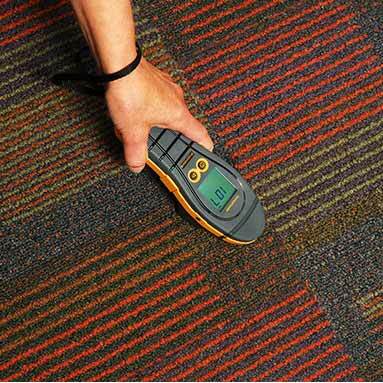 Measure the dry standard or baseline material until the meter’s reading is stable then press for a few seconds. This will store the reading until the mode changes of the meter turns off. Now all readings taken after will be displayed as normal, but below you will see a second reading that shows you if the material is measured above or below the original reading. User adjustable features: Auto shut off 1-6 mins, Backlight on/off, Audible on/off, Dry, At Risk and Wet Indicator on/off. Warranty - 24 months on mechanical or manufacturing defects. Does not include wearing part or accessories. Includes: Instrument, 5 in (127 mm) deep wall probes, moisture probe, calcheck, 2 spare pins, pouch and instructions.